Today, we’ll be taking a look at the BLACK+DECKER CHV1410L 16V, a cordless handheld vacuum. This handheld vacuum is 17.2 inches long and 7.8 inches tall at its tallest points. Additionally, the width is 5.5 inches at the widest point. The cleaning head’s width is about 2 inches. And lastly, the vacuum weighs 2.6 pounds. This BLACK+DECKER cordless handheld vacuum is powered by a 16-volt battery. 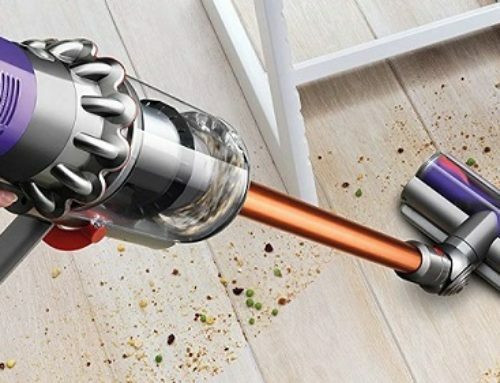 This vacuum includes a handful of tools and accessories that are built directly on the vacuum itself. This is the standard configuration with none of the accessories attached. The crevice tool is actually built into the main head itself that simply slides out to give you a little bit extra reach. To slide it back in, you simply press down on this little button area which releases the lock and then you slide that back into the head. The dusting brush is on the underside that simply slides out and then locks into place. Lastly, we have the rotating head. The main cleaning head can be rotated around to a side position giving it a little bit of a different position. It can also go the other direction. You simply hold down that button to unlock it and then rotate to lock in place. The rotating head is an interesting feature albeit a sort of confusing one. We are not sure what sort of significant cleaning advantage you gain from this configuration versus this configuration, but suffice to say, it’s not necessarily a negative either. 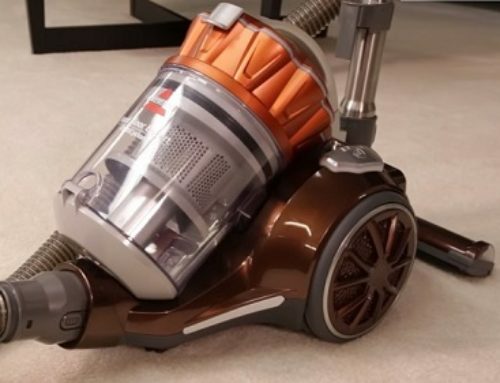 This vacuum can run for about 10 minutes on a full charge and takes 4 to 6 hours to fully charge back up. We complete a total of 12 unique cleaning tests testing each of our four debris types on three different flooring types. 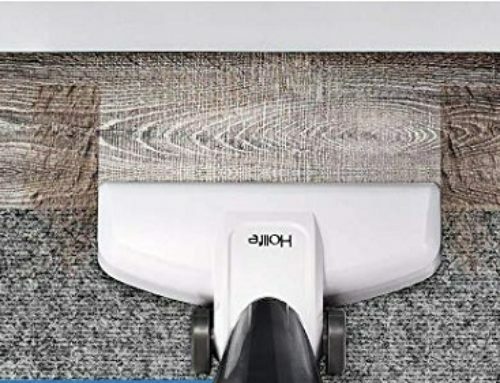 For each of our cleaning tests, we make cleaning passes back and forth measuring the amount of debris that is removed from the cleaning surface. Our testing line includes three different floor types: engineered hardwood floor, low pile carpet, and a high pile carpet. On each of our floor types, we test for different debris types including: rice, kitty litter, cereal, and sugar. Overall cleaning performance on the BLACK+DECKER CHV1410L 16 volt was extremely good. There’s really not a whole lot to say. Performance was just great across the board on our hardwoods, low pile, and high pile carpet. There was a little bit of struggle for sugar increasing as we increased carpet lengths, but even in the worst case, it was still performing at 91% cleanup or better. Overall, usability is pretty simple for this cordless handheld. I definitely like that all of the tools are directly on the unit. You’ve got your crevice tool. You’ve got the dusting brush that just pops right out. So that’s really nice to have as it just means you don’t got to go around the house looking for extra parts that you’ve stored in other locations. Keeps it all nice and simple. Maintenance is fairly straightforward as well. To empty the dustbin, you simply grasp these gray buttons along the side of the front nozzle that releases this portion and then you can simply empty that into your trashcan. Getting to the filter is just as easy. There’s simply a button along the top of the unit, depress that, that releases the back of the unit. We have the filter here and that just simply pops out for cleaning or replacement. Annual maintenance costs on this vacuum should be around $7. You need to replace the filter every six to nine months and the filters we’ve seen on Amazon have usually been around $3.50. One major negative with this cordless vacuum is just the difficulty in finding a replacement battery. During our research, we weren’t able to find one. So when this vacuum’s battery is dead, you probably are just going to need to completely replace the unit. All vacuum reviews go through our standard noise tests. For these tests, we use our sound meter to measure the noise in terms of decibels. This vacuum comes at between 80 to 83 decibels depending exactly on the angle of the motor. Overall, we found the BLACK+DECKER cordless handheld vac to be pretty good. I definitely like the overall cleaning performance, top to bottom on all surfaces and most debris types it was exceptionally well. We also like that the maintenance is fairly inexpensive at around just $7 a year. Perhaps the biggest and negative about this vacuum is simply the difficulty in finding a replacement battery. During our research, we weren’t able to find a place to purchase a replacement battery so when this vacuum is dead, it’s probably dead for good. The only other slight negative with this cordless vac is simply the runtime. At only 10 minutes, it’s definitely not the longest cordless runtime we’ve seen in a handheld vacuum.